Advances in technology has changed consumer behavior considerably in the last two decades. A wealth of information is now available to savvy consumers, who extensively research a purchase before pulling the trigger. This behavior has made its way to business world, as buyers of business technologies, products, and services doing the same type of research before ever connecting with a salesperson. So let’s get real: buyer behavior have changed so much that the traditional sales playbook, developed years and years ago, simply doesn’t work any more. Today’s business buyers independently seek out information about products. During the awareness stage, buyers rely on search, vendor websites, and newsletters/emails as their top channels to find information. Once they’re ready to buy, they opt to connect with a sales representative. Frontline sales representatives acknowledge the shift in buyer behavior. 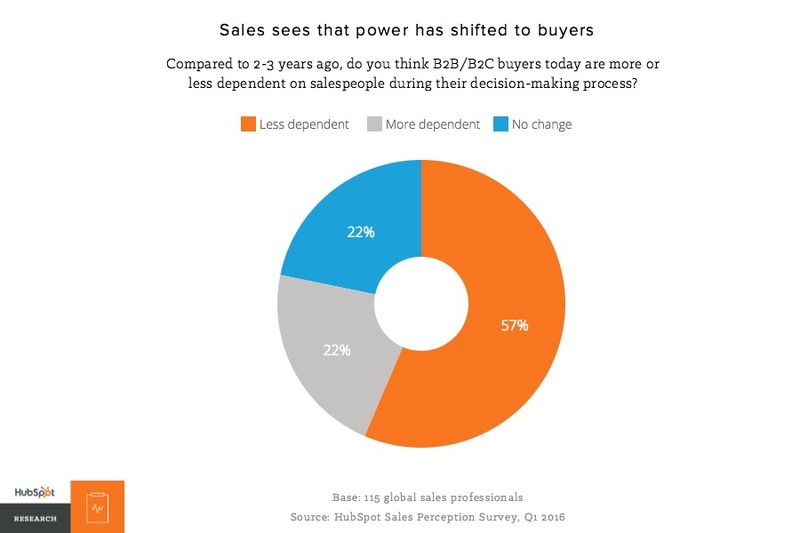 57% of salespeople agree that buyers are less dependent on sales during the buying process compared to a few years ago. The question is: have they adapted their selling practices to keep base with this shift? 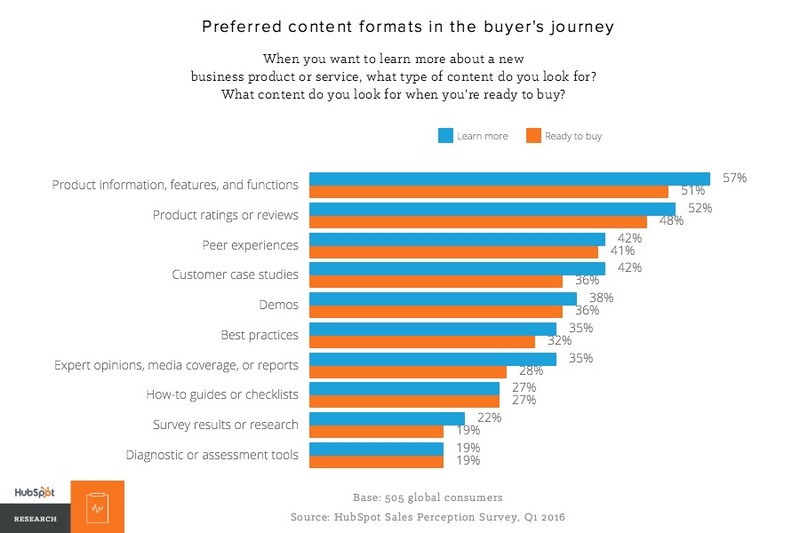 In terms of content types, buyers consume nearly everything they can access during the awareness and purchase phase. 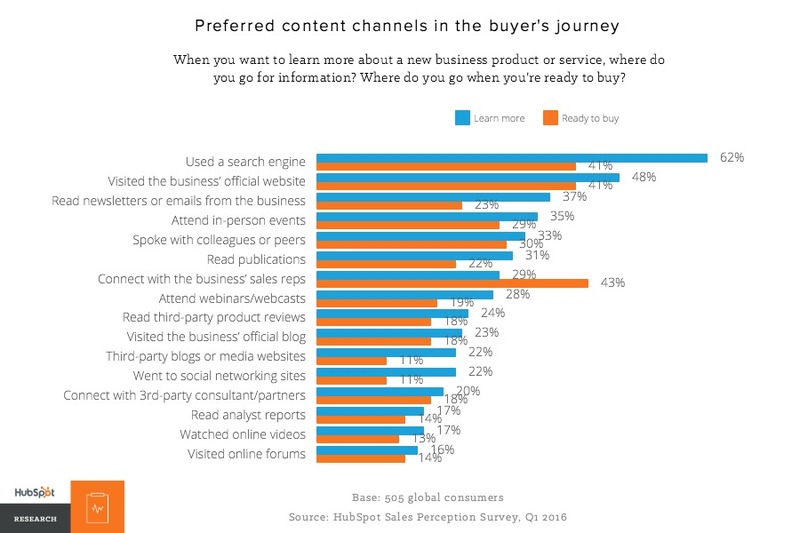 What may surprise salespeople is that buyers seek out product demos very early on in the buyer's journey (demos rank fifth overall for content types -- above best practice tips, expert reports, how to guides, etc). Often sales organizations peg the demo as the final closing action. Our data shows that a third of buyers want the opportunity to see a product in action very early on. They want a very tangible understanding of what they’re potentially buying, and they want it right away. 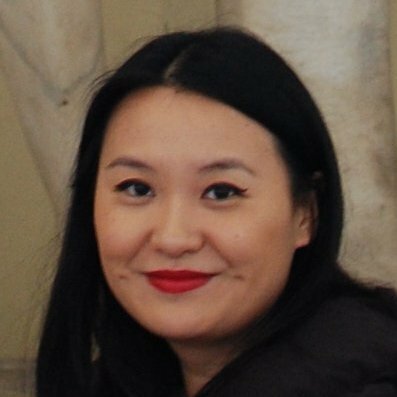 "Business are giving demos at the wrong time." How can businesses rise to meet this new expectation around demos? Most teams can’t spare valuable sales time on an early product demo before a buyer is properly vetted. A pre-recorded video demo that is clearly visible on a vendor’s website can satisfy the buyer’s content needs and has the potential to be an useful prospecting and qualifying tool for companies that have products that require demonstrations. 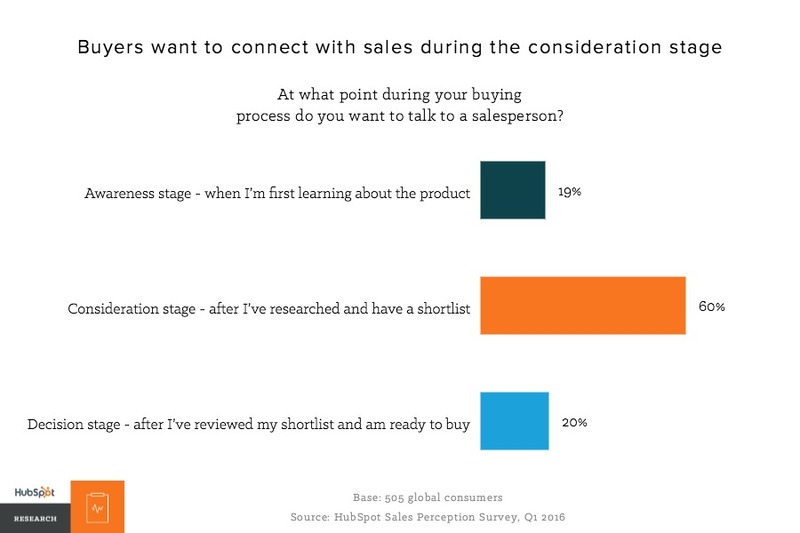 Since buyers today conduct a lot of advanced research, they feel confident in their knowledge of the product they’re considering and have very specific expectations when they finally talk to a sales representative. 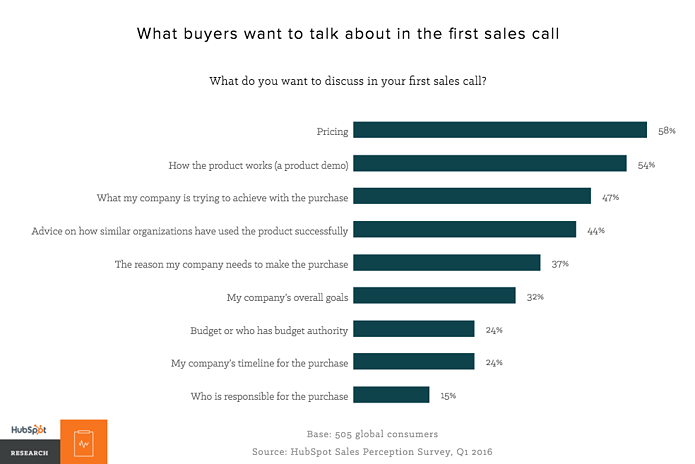 Our data shows buyers want to cut to the chase and dig into pricing and how the product works when interacting with sales for the first time. 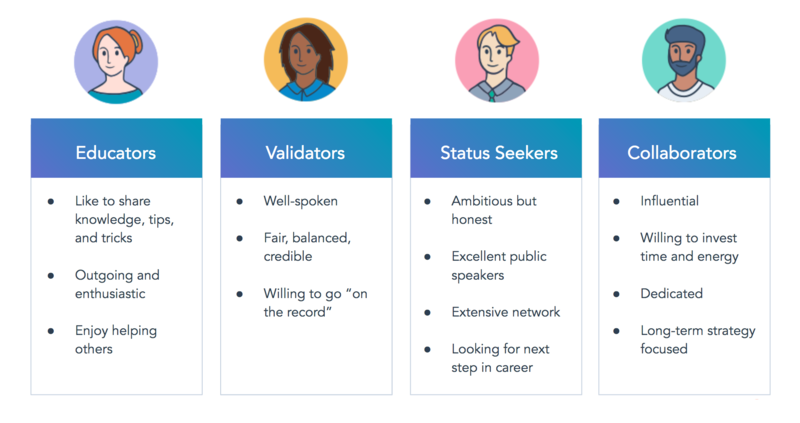 If we compare buyer expectations against what salespeople traditionally cover, we see a pretty significant disconnect (see the figure below). 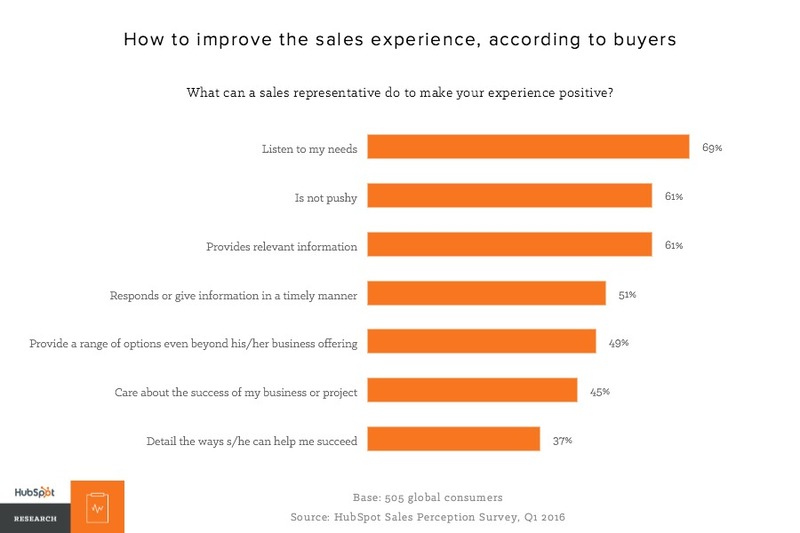 Sales needs to meet buyer expectations to create a positive experience. But the goals of buyers and sellers are at odds during the first sales call. Buyers are trying to get the information they need (pricing, features, etc) and sellers are trying to get the information they need (is this buyer qualified, their timeline, who signs the check). Something will have to give. There’s little chance of the buyer changing their expectations, so the onus falls on sales organizations to adapt. "The goals of buyers and sellers are at odds during the first sales call." It is worth noting that while buyers today are massively more well informed compared to 10 years ago, they are likely still missing crucial information that they haven’t considered in their research -- information that only a salesperson can provide. Logistical considerations like how long an integration/installation will take, how long it typically takes to see results, or even if the product is a proper fit for their organization are rarely found online. Buyers might think they want to get right down to pricing (because they're ready to pull the trigger now), but it's quite possible there are a lot of other potential sticking points or requirements that they don't know about at all. Salespeople should certainly answer buyer’s questions and provide them with the information they want, but they should also seed those considerations by asking buyers open-ended questions that make it clear there's more to consider and learn. Sales knows what a buyer wants to discuss going into a conversation - they hear it everyday. Leverage the most common buyer questions to rework the standard qualifying script. For example, if a buyer wants to talk features, pivot that conversation into how they'd use those features to achieve their overall goals. If a buyer wants to get straight to the price, a salesperson can use that as a chance to expand the conversation to review other costs -- like time and resources -- that go along with pricing. Ask the buyer if they have those resources ready rather than focusing solely on the product’s price point. The key is not to evade buyer questions -- sales representatives need to answer and expand! The good news for sales is that the majority of business buyers want to meet with sales during the consideration phase -- after they’ve done some research and know they need more information to make a sound decision. After finding out what the buyer knows, a well prepared sales representative can elaborate on their product and share advice they are best equipped to provide. This advice should be new to the buyer and educate them further on the product or service. Besides the clear disconnect that sales and buyers have when they first talk to each other, sales has another, more pressing challenge to overcome. The prevailing stereotype about salespeople linger in popular culture, and needless to say, they are not very flattering. 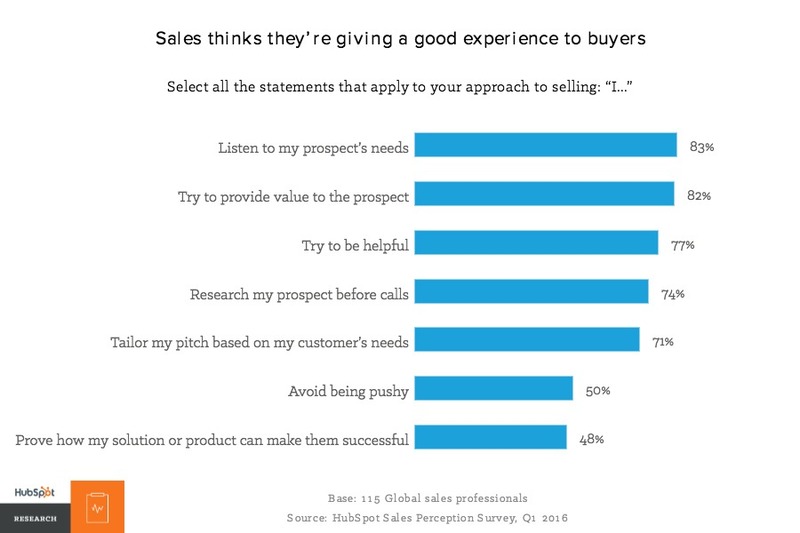 In an unaided, open text question asking respondents to describe sales, HubSpot Research found there is still a strong association with salespeople being overly pushy and aggressive. In a separate question, consumers today indicated they trust information they receive from customer service, marketing, and then sales. To piggyback off the goodwill that services and marketing gets, sales leaders should work closely with marketing and service teams (if their company has one) to coordinate how each department can produce and share content to buyers. Sales, Marketing, and Services should also align their product story. There is nothing worse for a new customer than being sold on a product, only to later connect with a service representative who tells them ‘oh this feature has been broken/not available/is in beta’. Reframe content around what's best for the customer, even if it's not sales driven at first glance. For example, offer a transparent comparison chart between your business and competitors or include links to third party review sites where buyers can see unedited reviews. Buyers will find that content anyway, so why not make it available to them and generate some goodwill in the process? How can sales overcome a fairly serious deficit in trust from today’s consumers? The answer may lie in changing themselves into a trusted advisor rather than a straight seller. Salespeople know their product in and out and have insights on past customer successes, ideal use cases, historical product information -- these are all data points that today’s confident buyers rarely have access to. 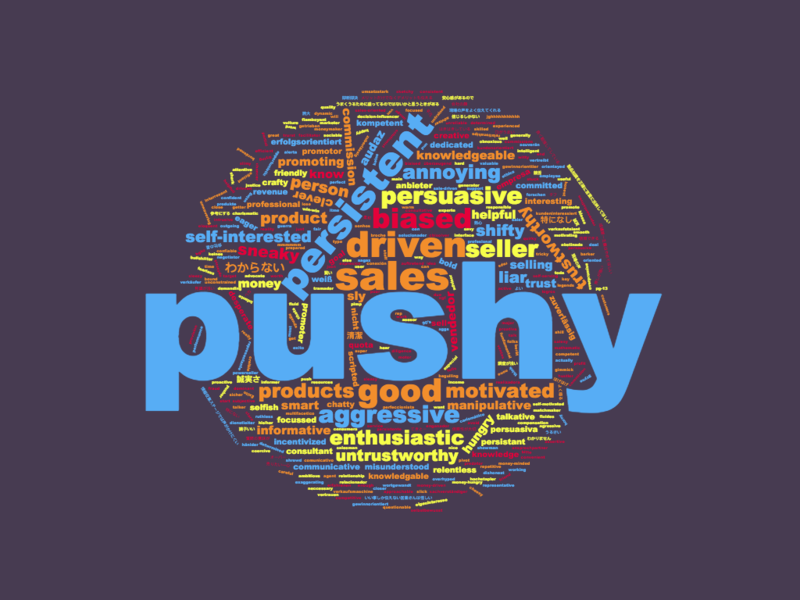 Buyers today really want to avoid pushy sales representatives. They’re looking for someone who will listen to their needs, provide relevant information in a timely manner, and are invested in the success of their business. Some of these buyer demands are pretty reasonable. They should be met by every sales representative in the world. 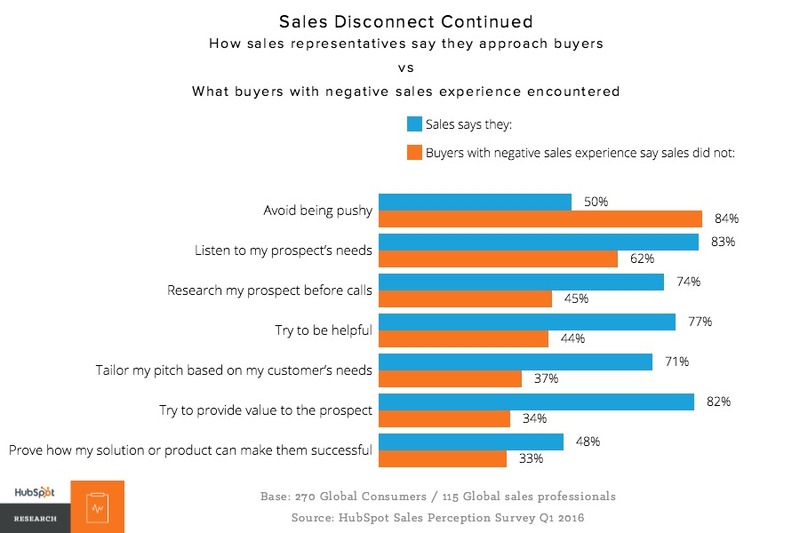 But when we look at our data from salespeople, there is a disconnect between how sales thinks they present themselves and what buyers are experiencing. However, the buyers we surveyed invalidates sales’ rosy self perception. Buyers who have had a neutral or negative with sales say the representatives were pushy, didn’t listen, weren’t helpful, and couldn’t prove value. 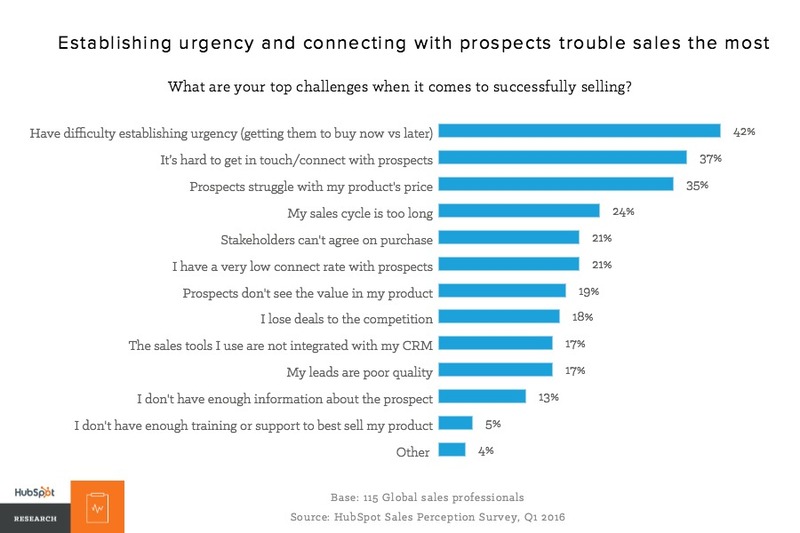 Given how difficult it is to connect with a buyer and actually get them on the phone (see the figure below), sales can’t afford to adopt a pushy, transactional script to close a buyer. Content for each call should be tailored to the buyer’s business model or industry, goals, and timeline. Getting the relevant buyer background information to sales will require technologies that capture browser history and company context and engaging in new prospecting activities like social selling. With respect to timelines especially -- it must be noted that modern sellers cannot force buyers to buy on the salesperson’s timeline. The buyer does not care, and has never cared, that the representative’s quota is closing at the end of the month. If a buyer isn’t ready, prepare some templates to keep them engaged as their decision-making process matures. Instead, modern salespeople, which HubSpot refer to as Inbound Sellers, need to help buyers make the best decision at the right time for them and their companies. The previous chapter laid out some hard truths for sales representatives -- buyers are overly confident in what they know, they aren’t interested in catering to a sales representative’s qualifying script in phone calls, and they have a generally low opinion of sales in general. Salespeople today seem to occupy an unenviable role as a gatekeeper between the product and buyer. Advisory. Inbound sales is about building trust with your buyer. Salespeople should help people make buying decisions, more than just making a sale. To combat prevailing buyer prejudices and to add knowledge and value to the conversation, sales need to transform themselves into advisory, service-oriented organization. Sales representatives need to ask themselves: Can I help the prospect? Do they need my help? And most importantly, do they want my help? Personalized. Tailor your sales content to the wants and needs of your buyer. As you learn more about your leads over time, you can better personalize your messages to their specific needs. Sales representatives today can (and should) leverage a whole host of technologies to understand what buyers are saying online and which buyers are visiting your website, opening your emails, and even viewing your pricing page. Over time, organized sales teams will be identify the behaviors of best fit customers, leading to better qualified leads. Buyer-Centric. Basing the entire sales process on the buyer, rather than the seller. 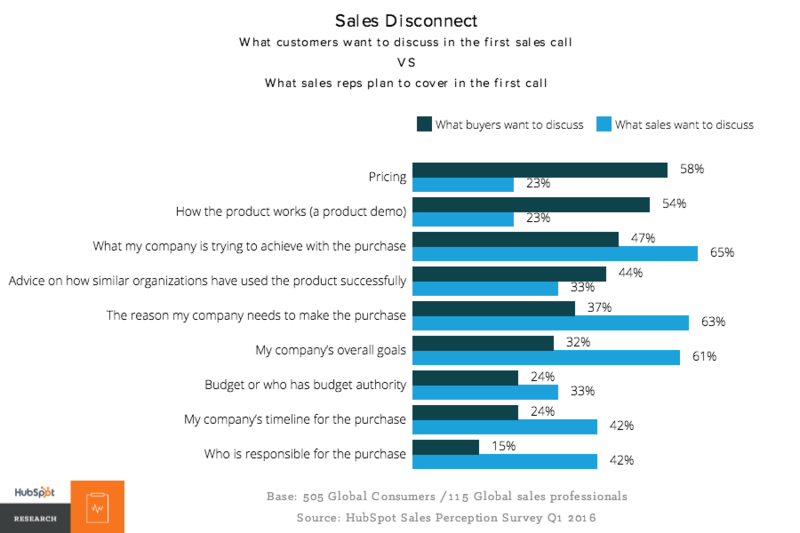 In interactions with buyers, sales representatives need to actively inquire about and listen to the buyer's challenges and goals for the purchase. As a consultative advisor and product expert, the sales representative can then share concrete plans for the buyer can accomplish their goals or address their challenges. This may include the buyer using their solution, if it's a good fit. Sometimes, it’s in the sales representative's best interest to point buyers to a different product or service. Buyer’s expectations of sales are low. Salespeople can certainly beat those expectations by adopting an inbound sales strategy and maybe delight the buyer in the process. HubSpot fielded a global online survey from January 2016 through February 2016. The survey was translated into German, Spanish, and Portuguese. The responses were sourced via email invitations, blog promotion, social sharing, and supplemented by a paid panel via Survey Sampling International. No personal information was collected and no incentives were offered for non-panel responses.